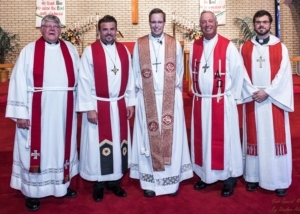 On June 30th, Holy Cross Lutheran Church in Mobile, AL, welcomed Pastor C.J. Luttinen to lead our congregation. Pastor Luttinen was installed by former President Emeritus of the Southern District, Rev. Kurtis Schultz. Vacancy pastor, Rev. Steve Schrader, was the liturgist and Rev. Wayne J. Miller from Grace Lutheran Church in Mobile was the guest preacher. We are incredibly blessed to have Pastor C.J. and his wife Katie join our family, and we extend our sincere thanks to all the pastors and churches in Circuit 11 who helped us during our vacancy.